Regarding vocations to the Priesthood, one significant and observable factor emerges in regard to more recent ordinations. Where as in the past Ordinations seem to have come almost by osmosis through Catholic families and participation in Catholic parishes and schooling communities, so many vocations to the Priesthood these days come from a place that has not been so much “inherited” but a place given afresh by the Holy Spirit. We see this especially with the calling of the Holy Spirit of Joshua Scott to the Priesthood. This journey has not been walking in a bed of roses! Quite the opposite: for Josh, there has been some very deep times of personal anguish and some marvellous times of Godly consolation. This question arose particularly out of the unexpected illness of his younger sister who was four at the time. Joshua was looking for answers to an illness of an innocent sister and set out to find answers from the world around him. From this point we see the Holy Spirit calling Joshua to something beyond what he ever thought or imagined. He moved from a position of largely agnosticism to a position of profound inner yearning. Surely this is a quintessential sign of the presence of the Holy Spirit. There is always the supremacy of grace in any call from God…and for Joshua it specifically meant eventually the call to the Priesthood. All of this is God’s initiative to bring us into his Trinitarian love. It is a sharing of the Father, Son and the Holy Spirit deep within the human heart. As I said at the beginning of this homily, often we have presumed this as being almost inherited from our family over many generations. This is not the case in the developed world today. All of us need to experience this love relationship in a fresh way as if for the first time regardless of our family background. Indeed, you can’t simply have an inherited Christian faith. It is simply not possible, especially in today’s highly secularised Australian world. It’s simply not strong enough to withstand the challenges to faith in today’s world becoming more and more a stranger to the Christian Catholic ethos. We thank you dear Josh for sharing your life story with us and it helps us to renew our own faith in Jesus, the Saviour and Redeemer. It is quite clear, dear Josh, that the maturation of your love for the Lord has now reached this more public stage were you want to become a missionary disciple of the Lord as a Priest in the Order of Melchizedek…which is an eternal order and finds its heart in the Priesthood of Christ which has been given to you already in Baptism but now is going to be expressed in a particular way through the Sacrament of Holy Orders. When I think of exercising the ministerial Priesthood in today’s Australian world I recall a beautiful autobiographical story that was told to me many years ago by Cardinal Schönborn, the Cardinal Archbishop of Vienna in Austria. He recalled that before his Episcopal Ordination, one of the priests of his diocese shared with him personally his hope for the Archbishop in his ministry. It is a hope that I think all Priests and Deacons should be able to share, especially now in this fluid society of Australia. He said that the young Priest shared that before his Priesthood he was a shepherd in the Austrian Alps. Sometimes, during the snow caped winter season, there were very little green fields for his few sheep to find sustenance. As a shepherd this would concern him greatly. But then he just allowed the sheep to wander a little bit more than he would normally do. The sheep seemed to have some answers that he didn’t have. Sure enough, the sheep went to certain parts of the field and started burrowing with their feet to find some grass hidden under snow. This was able to sustain them in the hard times. The shepherd Priest said that he would never have been able to understand this himself if it wasn’t for the sheep guiding him. This is a very good example Joshua about allowing the laity, also imbued with the great gift of God through the sacrament of Baptism, not only to be led by you but also to allow them to lead you in this strange world that we find ourselves here in Catholic Australia. I think it is an important point that the expression of the Priesthood and the years ahead from a pastoral point of view must be exercised more decisively in co-responsibility with all Baptised Catholics. This remains a challenge for many Priests today. On an associated analogy, it has been observed, in the developed west at least, that Catholic Priests are more pastorally equipped to be shepherds rather than fishermen. But in a society that is thinking twice about the value of religiosity or authority of any kind, the more kerygmatic-fisherman image of the scriptures in regard to discipleship certainly needs closer attention for the way is can be expressed in today’s world…. Finally, placing aside such observations, we now humbly invoke the presence of the Holy Spirit to come down upon us and ordain this man, our brother, Joshua Scott, to the Presbyteral Orders. We also invoke the intercession of Mary, under the title of OUR LADY OF FATIMA, who on this day, 100 years ago appeared to the children at FATIMA and pledged her maternal care. Into her care we now also place our dear brother, Joshua. 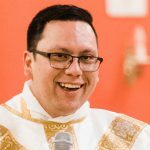 Joshua Scott has a strong devotion to Our Lady, so being ordained a priest this month a century after the apparitions at Fatima makes it an even more a special occasion. 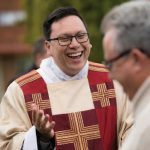 Father a Catholic convert from Young NSW is the latest ordained priest of the Archdiocese following his ordination at St Christopher’s Cathedral Manuka on October 13.